This is my alter-ego, the one that prefers beer over martinis, and thus writes in an entirely different way. Both of these e-books are 99 cents each, less than a bottle of Blatz. 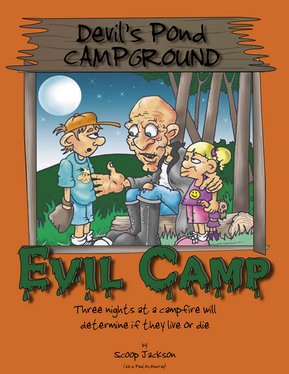 As part-owner of a campground in Wisconsin for 25 years, I've heard--and told--many a scary story around a campfire, and I think "EVIL CAMP" will keep the kids (and maybe you) up all night. "Adventures In Camping" is the best (and worst!) of all the goofy things that happen when you're having fun while camping. And remember--it could happen to you! You can get more "Scoop" at www.scoopjackson.net. With their father mysteriously missing, Hunter, age 14, must protect his ten year-old sister Katie from whatever lurks in the woods and fog that surround them. They are at Devil's Pond Campground, a deserted place where the few remaining letters on the sign spell out EVIL <?xml:namespace prefix = st1 />CAMP. Their only contact is with Digger, an ancient caretaker with sunken eyes and tombstone teeth. Digger warns them not to leave their campsite--not even to find their father--and to keep them there he tells scary stories for two nights: "The Hand" and "The Boy Who Had No Bones." When Digger himself disappears, Hunter is ready to give up all hope of surviving. But Katie has made a plan of her own--she has become friends with some animals in the forest, and their leader is coming to visit tonight: "The Vampire At The Campfire." Keep yourself up all night with the entire book or "chop" it into three creepy parts! Either way, when you finally can, sleep tight and don't let the vampires bite. 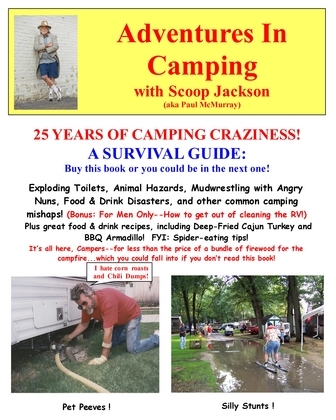 25 years of camping craziness--A Survival Guide! Exploding Toilets, Animal Hazards, Food & Drink Disasters, and other common camping mishaps! Plus great (and real!) food & drink recipes, including Deep-Fried Cajun Turkey and BBQ Armadillo! And for you nature lovers: Spider-eating tips! If you camp, you need to read this book--or you could be in the next one! Scoop jackson reports the facts, just the facts--with added detail only he is privy (ha-ha) to! And yes, I am the lucky woman married to the spider eater written about in these crazy camping tales. During one camping adventure, I didn't serve dinner quickly enough. He (my husband) was hungry after consuming a few cocktails, and he proceeded to swallow three daddy longleg spiders in front of our young children! Help me...Now he has a discerning palate for cicadas--thank goodness they only come out every 17 years.